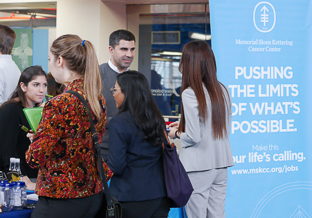 Employers came in droves to recruit Columbia Mailman School students at the Spring Career Fair, likely the largest such event at a public health school in the country. In all, 84 organizations were on hand, from government agencies and hospitals to consulting firms and NGOs. A number of them invited their Columbia Mailman alumni employees to help them make their case. 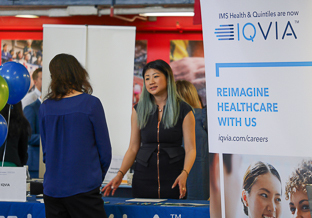 The Career Fair brought Samantha Tomicki, MPH ‘16, full circle. It was at the same event several years ago that she got her job at the consulting firm Milliman. The pattern could easily repeat itself. According to Tomicki, who spoke with dozens of interested students throughout the day, there was ample evidence that Columbia Mailman continues to prepare its graduates to succeed. “Everyone here has a strong set of skills,” she said. Marlene Riquelme, MPH ‘16, a public health specialist at the Harry and Jeanette Weinberg Center for Elder Justice at the Hebrew Home at Riverdale, was looking to replace herself after getting a job with Planned Parenthood. A background in aging would be a plus for the Weinberg Center position, but not a prerequisite. Riquelme herself studied sexual and reproductive health, but applied after seeing the listing advertised by Career Services. “My heart pulled,” she said.